Spring has officially sprung and I can’t help myself from eating all of the vegetables I missed during the colder months, especially fava beans. Fava beans or broad beans are super seasonal vegetables that arrive in April and are usually gone by May. Because favas are a little time intensive to shuck the easiest way to eat them is to roast them in the oven (or on the grill) whole with a little olive oil for about 5 – 7 minutes until soft. But if you have the time, they are delicious and gorgeous in a light and fresh spring salad. The best way to shuck favas is to remove them from the pods, blanch them for a couple seconds in boiling water, plunge in ice water, then pop them out of their skins. They are time intensive but totally worth it, I promise. In this salad I mixed the favas with some quinoa, sugar snap peas, red onion, mint and feta cheese. It is the perfect salad to welcome in the warmer weather and longer days. Plus I am sharing my all time favorite salad dressing with this recipe. The secret is in the honey and a large pinch of salt. If you can’t find favas you can swap in English peas or even de-frosted frozen edamame. 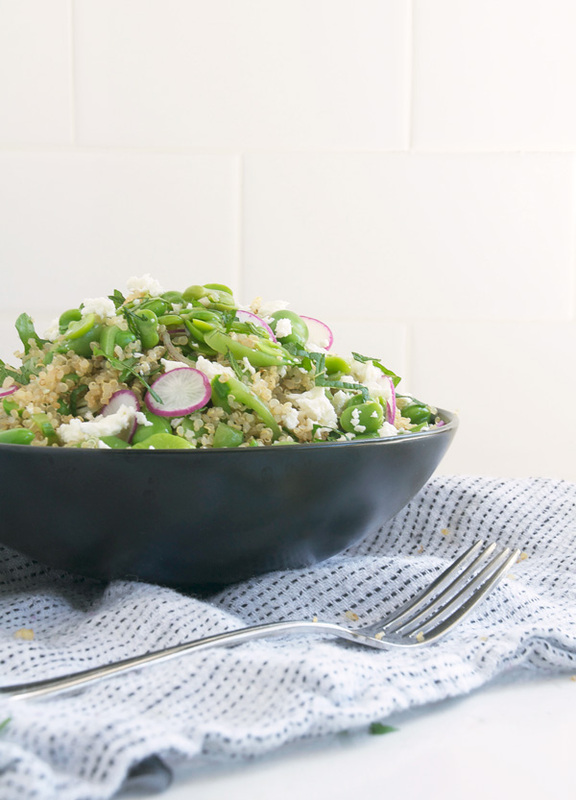 In a large bowl, combine the quinoa, fava beans, sugar snap peas, radish, mint and feta cheese. In a small bowl, mix together the olive oil, vinegar, honey and large pinch of salt.